U.S. 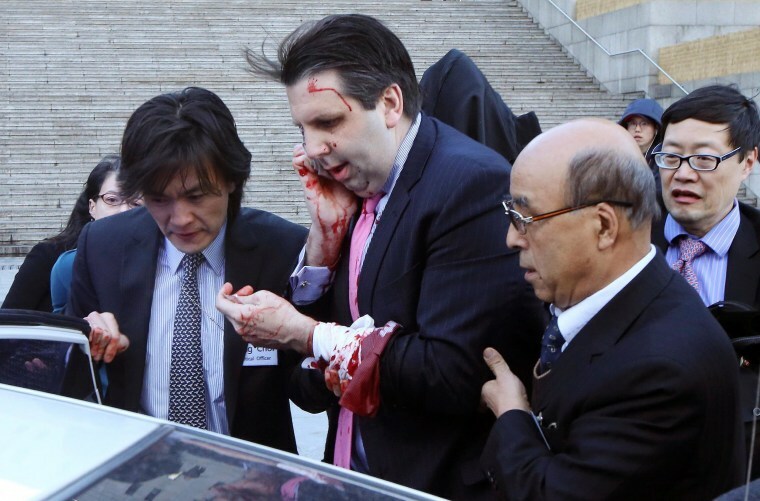 Ambassador Lippert Attacked in South Korea: How Did It Happen? How did a knife-wielding attacker manage to slash the U.S. ambassador to South Korea — and what does it say about diplomatic security? Observers have credited a quick response from security services for subduing the assailant as he took swipes at Ambassador Mark Lippert's face but security officials will now be examining what could be done to prevent an attack in the first place. "There are lots of questions that need to be answered," according to Joseph LeBaron, former U.S. ambassador to Qatar and Mauritania. "It is alarming that the attacker could get so close." Embassy officials have declined to comment specifically on Lippert's security detail. While LeBaron said he's "certain" that the State Department and embassies around the world will take a "very close look" at the security arrangements in place for U.S. ambassadors in light of the attack, it is too soon to say if there was in fact a breakdown in security. Diplomatic security "varies so much from country to country," Lebaron said. "There are a variety of approaches. " "The takeaway is: It's a risky business"
In some countries, the host government provides diplomatic corps protection, he explained, noting the benefits of having local bodyguards who know the language and local culture. LeBaron — who has spent time in South Korea — described the security there as "very good" and "very well trained, saying he knows that "the commitment to the security of the U.S. ambassador there is extremely important to the government." South Korean police are providing additional security to the U.S. Embassy in Seoul following the attack on Lippert, who is recovering in the hospital. Police were present at the venue where Lippert was attacked on Thursday — part of routine operations but not at the request of the U.S. embassy or the organizer, a police official said. Would closer protection have made a difference? Maybe — but at great expense, according to LeBaron. "Is it a lapse in security when someone, anyone, can get so close to a U.S. ambassador as to wound him?" Lebaron asked. Some, he said, would argue no. The security services' success could be measured on the ability to intervene quickly in case of an attack — but not necessarily prevent one. That's because ambassadors by nature are meeting and greeting people on a regular basis — and closer protection could hinder the work. "All ambassadors have to get out and do their jobs," former U.S. Ambassador to Ukraine William B. Taylor said. "If the diplomatic security or South Korean security forces were surrounding the ambassador it would be hard for him to do his job." While it is the responsibility of a host government — in this case South Korea — to provide security for diplomatic activities and embassies, "the level and the intensity of that security varies from country to country and even within the country over time," Taylor said. He, too, noted that "South Korea is a stable, friendly U.S. ally that has very competent security organizations and security services." Taylor said there's "no reason" to believe there was a security lapse or fault by either the South Korean security services or U.S. diplomatic security around the Lippert attack. "The takeaway is: it’s a risky business," he said. " U.S. diplomatic personnel… understand that this is a profession that entails risk." The only way to eliminate all risk, he said, would be for an ambassador to stay inside an embassy at all times. "No ambassador wants to do that, no ambassador would accept an assignment to go to a country and represent the U.S. if he or she were told they can only do their job from the embassy," Taylor said. "Whenever you're out and about anywhere — whether its in London or Seoul or Benghazi or Tripoli — there is some risk. It's an honorable profession, it's a satisfying profession but it does entail some risk. If you don’t want to accept that risk then you don’t take the job."